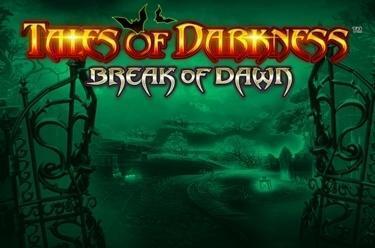 Play Tales of Darkness™ Break of Dawn online for free now! Welcome to the realm of the undead! In Tales of Darkness™ Break of Dawn a mystical and mighty couple holds the key to inexhaustible Twist riches. Will you earn their favor? Find out for yourself on 5 reels and 50 fixed win lines and embark on a nocturnal excursion almost guaranteed to give you the creeps. Keep your eyes peeled for at least 5 adjacent identical symbols on one of the win lines running from left to right. The good news is: 3 or more matching symbols side by side along a win line are already enough to boost your Twist balance! All wins pay from left to right except for the Scatter. The Wild symbols (Male and Female Vampire) can substitute for any other symbol (exception: Scatter) to generate winning combos. The Scatter symbol (Moon and Bats) triggers 15 free games with the Break of Dawn Bonus when it lands at least 3x in any reel position. During the 15 free games (triggered by at least 3 Scatter) 3 different Wild symbols might appear with some luck that can cover entire reels and move along to neighboring reel positions which increases your winning chances. Men or Women symbol: Potentially appear on reel 3, spread to the entire reel and move along in one direction to neighboring reel positions during the next two free games (Men symbols to the right, Women symbols to the left). 2 more free games are triggered. Couple symbol: Potentially appears on reel 3, spreads to the entire reel, splits and moves along in BOTH directions during the next two free games. Also, two more free games are triggered. During this feature the number of win lines doubles and the playing field changes from 5x4 fields to 4-4-5-4-4 fields. Plus: Further free games can be won during free spins. When the sun goes down, the creatures of the night arise! In Tales of Darkness™ Break of Dawn you enter the grim realm of the vampires where you hunt for Twists – so prepare for some spine-chilling surprises. 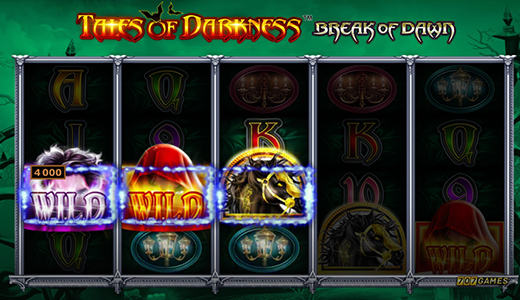 Will you take this thrilling challenge and fight for winnings?